Situated almost 25 miles (40km) off the coast of Maputo, Inhaca Island is an immensely popular African resort destination. It boasts beautiful beaches, some of the Mozambique Channel's best coral reefs, a historic lighthouse, a marine biology museum, and large areas of protected forest. Easily accessible from the capital, it's a favourite among snorkelers and divers who usually head for the reefs at Santa Maria, the lighthouse, or the surrounding sunken wrecks. The Santa Maria reefs have strong drift currents running parallel to the shore. They're fantastic for snorkelling, while the Wall is a rocky ledge that drops some 66 feet (20m) to the bottom, harbouring numerous caves and ledges filled with a variety of marine life. Game fishing and water sports like water skiing, parasailing, windsurfing, sea kayaking, and sailing are also popular on the island. Beautiful beaches ring Inhaca, visitors can enjoy a sunset cruise or take boats across to the deserted island. The resort has a tennis court and swimming pool, with excursions available to the biology station, lighthouse beach, the mangrove swamps, and the Santa Maria Wall. Restaurants are mostly limited to the lodge. However, the nearby village has a takeaway burger stand and an attached seafood restaurant, as well as a few small shops selling typical tourist tat like sarongs and seashells. There is no real nightlife on the island, though the lodge has a bar. 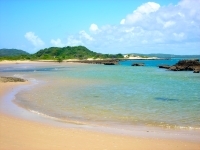 Many tourists find a visit to Inhaca Island a pleasant way to spend time while in Maputo. However, visitors should be prepared to pay dearly for every service on the island, including a tourist tax levied the second you step off the boat. Swimmers should also take care, as the bluebottles occasionally inundate the beach.